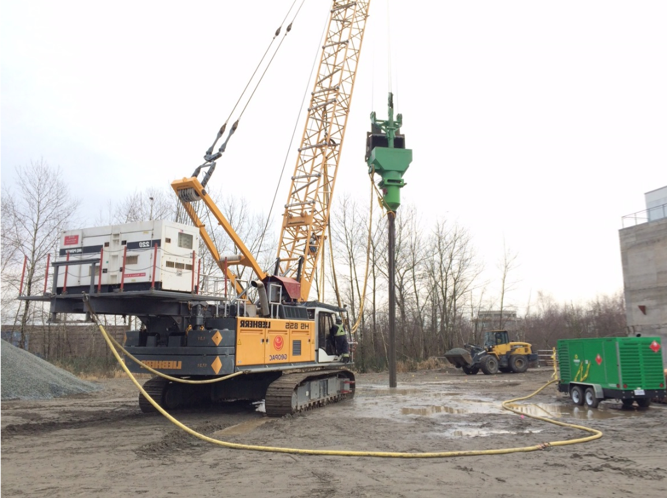 Pinnacle International is constructing a phased development at their Capstan Village site in Richmond, BC. Phase 1B of the project includes 3 residential towers of up to 15 stories in height. The existing soil profile at the site, from the surface downwards, generally consists of 0.3 to 0.6m of topsoil/fill over natural soils which comprise 2.1 to 3m of low plastic clayey silt and silty clay, over a 1 to 3m transitional sequence of interbedded silty fine sand to fine sandy silt, over silty to clean sand to approx. 22m depth. The sand is underlain by a thick sequence of marine clay silt extending to depths of over 100m. Groundwater was observed at approx. 1.0m below grade. Seismic analysis indicated that liquefaction was anticipated within the underlying loose silty sand to clean layers. Therefore, full displacement bottom-feed stone column densification was specified to densify susceptible soil down to 13.5m depth. Menard Canada installed stone columns on an equilateral grid using dry bottom-feed Vibro Replacement methods. 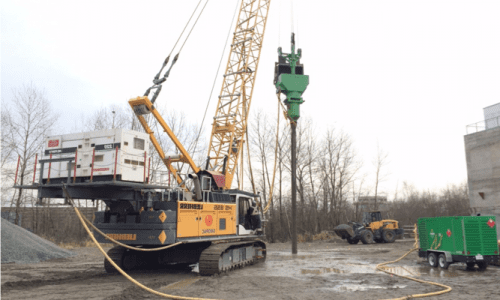 Shorter ‘secondary’ stone columns were installed to 5.5m depth at centroid locations of the primary grid pattern to reinforce the upper fine-grained strata directly beneath tower foundations. An initial trial area of 25 stone columns was first installed and tested to demonstrate the densification program was achieving the required method and performance based work. The remaining production work was carried out utilizing two bottom-feed Vibro rigs following the same installation procedures proven effective in the trial area.